By: C.S. Hammond & Co. 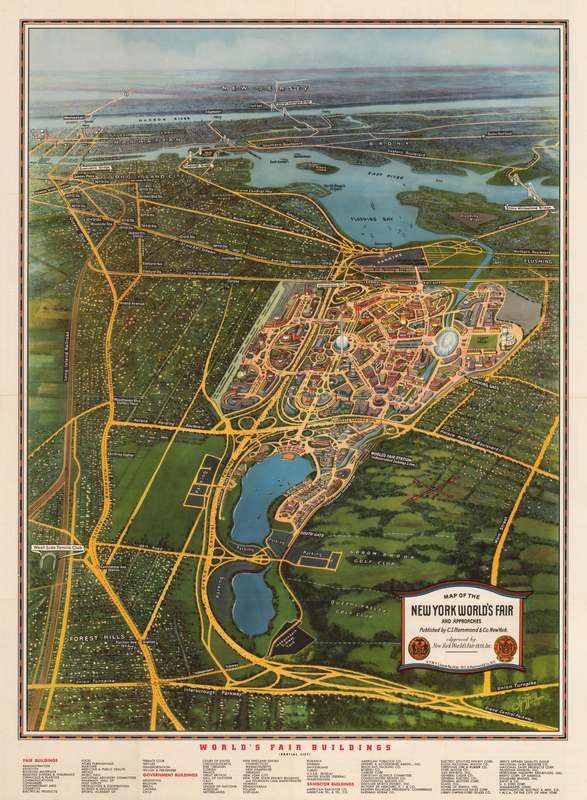 This Hammond & Company map of the New York World’s Fair provided visitors with a bird’s eye view of the area and the various means of access to it. The 1939 – 1940 Fair covered over two thousand acres of Flushing Meadows – Corona Park (which also hosted the 1964 – 1965 Fair) in Brooklyn. The event was the second most American World’s Fair of all time, exceeded only by the 1904 St. Louis Louisiana Purchase Exposition. Participants from around the world took part in the Fair, with attendance of over 44 million in the two seasons in which the fair ran. The Fair was first such exposition to be based on the future, with a slogan of ‘Dawn of a New Day’ and was designed to provide visitors with a look at the ‘world of tomorrow’, stating that ‘Familiarity with today is the best preparation for the future’. The map’s verso locates the Fair’s venue as it lies geographically speaking in relation to Manhattan. The verso also boasts a number of headings listing attractions such as points of interest, skyscrapers, stadiums, churches, museums and beaches and amusement parks. Within six months of the Fair's opening, World War II had begun. Condition: This folding map is in A- condition with negligible separations at some folding points.